Chemical signatures in shale, the Earth's most common sedimentary rock, point to a rapid rise of land above the ocean 2.4 billion years ago that possibly triggered dramatic changes in climate and life. In a study published in the May 24 issue of the journal Nature, researchers report that shale sampled from around the world contains archival quality evidence of almost imperceptible traces of rainwater that caused weathering of land from as old as 3.5 billion years ago. Notable changes in the ratios of oxygen 17 and 18 with more common oxygen 16, said lead author Ilya Bindeman, a geologist at the University of Oregon, allowed researchers to read the chemical history in the rocks. In doing so, they established when newly surfaced crust was exposed to weathering by chemical and physical processes, and, more broadly, when the modern hydrologic process of moisture distillation during transport over large continents started. The evidence is from analyses of three oxygen isotopes, particularly the rare but stable oxygen 17, in 278 shale samples drawn from outcrops and drill holes from every continent and spanning 3.7 billion years of Earth's history. The analyses were done in Bindeman's Stable Isotope Laboratory. Based on his own previous modeling and other studies, Bindeman said, total landmass on the planet 2.4 billion years ago may have reached about two-thirds of what is observed today. However, the emergence of the new land happened abruptly, in parallel with large-scale changes in mantle dynamics. 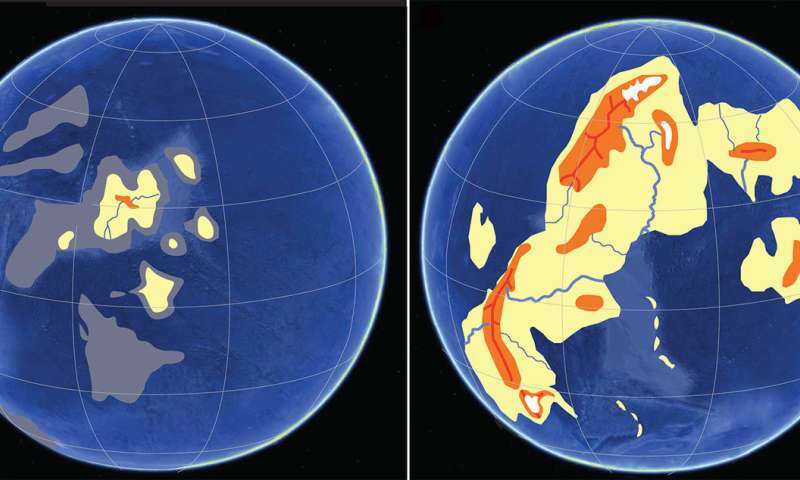 Isotopic changes recorded in the shale samples at that time also coincides with the hypothesized timing of land collisions that formed Earth's first supercontinent, Kenorland, and high-mountain ranges and plateaus. "Crust needs to be thick to stick out of water," Bindeman said. "The thickness depends on its amount and also on thermal regulation and the viscosity of the mantle. When the Earth was hot and the mantle was soft, large, tall mountains could not be supported. Our data indicate that this changed exponentially 2.4 billion years ago. The cooler mantle was able to support large swaths of land above sea level." Temperatures on the surface when the new land emerged from the sea would have likely been hotter than today by several tens of degrees, he said. The study found a stepwise change in triple-isotopes of oxygen around that time frame. That, the scientists said, resolves previous arguments for a gradual or stepwise emergence of land between 1.1 and 3.5 billion years ago. At 2.4 billion years ago, Bindeman said, the newly emerged land began to consume carbon dioxide from the atmosphere amid chemical weathering. The timing also coincides with the transition from the Archean Eon, when simple prokaryotic life forms, archaea and bacteria, thrived in water, to the Proterozoic Eon, when eukaryotes, such as algae, plants and fungi, emerged. "In this study, we looked at how weathering proceeded over 3.5 billion years," Bindeman said. "Land rising from water changes the albedo of the planet. Initially, Earth would have been dark blue with some white clouds when viewed from space. Early continents added to reflection. Today we have dark continents because of lots of vegetation." Exposure of the new land to weathering, he said, may have set off a sink of greenhouse gases such carbon dioxide, disrupting the radiative balance of the Earth that generated a series of glacial episodes between 2.4 billion and 2.2 billion years ago. That, he said, may have spawned the Great Oxygenation Event in which atmospheric changes brought significant amounts of free oxygen into the air. Rocks were oxidized and became red. Archean rocks are gray. In the absence of much land, he said, photons from the sun interacted with water and heated it. A bright surface, provided by emerging land, would reflect sunlight back into space, creating additional torque on radiative-greenhouse balance and a change in climate. "What we speculate is that once large continents emerged, light would be reflected back into space and initiate runaway glaciation," Bindeman said. "Earth would have seen its first snowfall." Shales are formed by the weathering of crust. "They tell you a lot about the exposure to air and light and precipitation," Bindeman said. "The process of forming shale captures organic products and eventually helps to generate oil. Shales provide us with a continuous record of weathering."